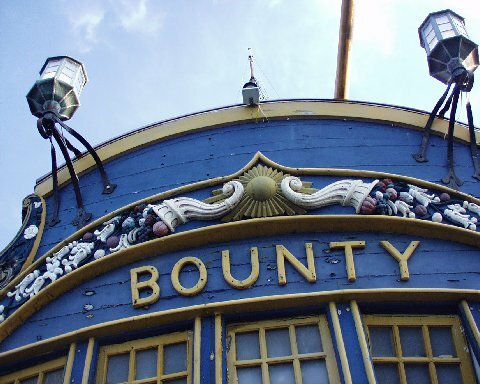 In the summer of 2002 we finally got BOUNTY back in the water. There was a lot of rigging left to do, and the interior work continued even after we sailed from Maine, but the ship was coming back! A fresh coat of paint, new systems providing propulsion and electricity, and new crewmembers eager to learn how to sail a square rigger. All that hard work (and money!) was paying off. Here a couple of the guys were having fun with the figurehead - BETHEA. She had sustained some damage over the years and they were demounting her to be sent out for repairs. Mike is substituting his head for hers, and the results aren't at all desirable! 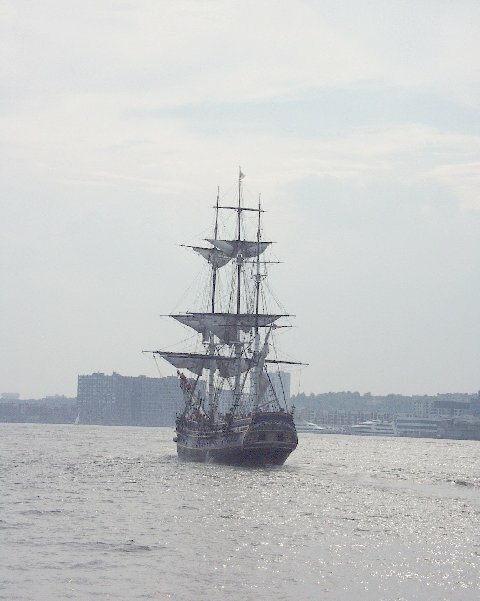 In early September BOUNTY joined thousands of other vessels on parade into New York Harbor and up the Hudson River, as a tribute to the victims of 9-11, and as a statement of the strength of America's character. I had the marvelous privelege of being there to photograph the unbelievable spectacle from the Staten Island Ferry and by running up the length of Manhattan. At times the ship was close enough to Battery City Park that we could recognize each other across the water, and carry on a conversation. BOUNTY stopped briefly at the aircraft carrier INTREPID to pick up some cadets, and I spent a precious few minutes aboard talking with my daughter and the Captain. What a beauty the ship is becoming again! 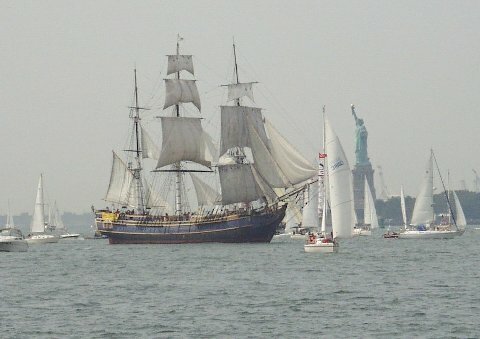 Notice she has her masts and most of the yards up, with sails bent on. Sad to see her leaving port without me, but I'll catch up a bit later. Here we see the Volunteer Sail - a day of enjoying the fruits of everyone's labors in Greenport, LI, the ship's homeport. A pleasant day for a sail, and everyone enjoyed themselves. 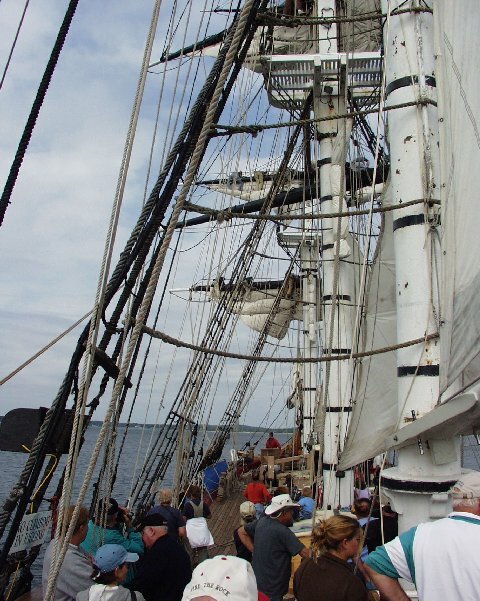 The deck certainly was crowded, but some went aloft when it was time to furl sails.